T Rick Wagner vs. 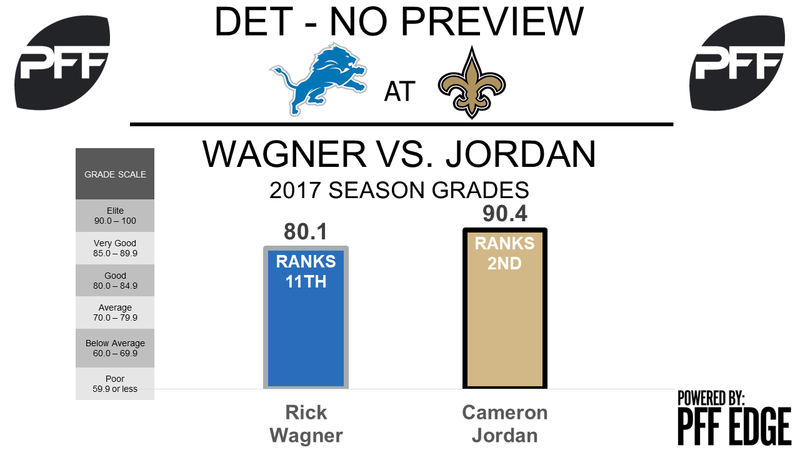 Edge Cam Jordan – A huge head-to-head battle this week that could potentially make or break the game. Jordan, the second-highest graded edge defender (90.4 overall) takes on Wagner, the 11th-highest graded offensive tackle (80.1). Jordan has rushed the passer from the left side of the defense on 113 of his 133 pass-rush snaps, so this battle should happen early and often. Wagner has really struggled in pass protection of late and over the last three games ranks 54th out of 69 qualifiers at offensive tackle in pass-blocking efficiency with a mark of 92.7, a mark just four spots better than the well documented struggles of teammate Greg Robinson. Meanwhile, playing two games over the same span, Jordan has made life hard on opposing offenses, racking up 10 pressures including two sacks and a hit on the quarterback. His 13.6 pass-rush productivity the past two games ranks fifth among 4-3 defensive ends. G T.J. Lang vs. DI Sheldon Rankins – Lang is maintaining his place as one of the best guards in the league, ranking third in overall grade (84.3). Lang has been equally impressive in pass protection as he has as a run blocker and has easily been the best Lion on offense at this point in the season. Rankins on the other hand is in the midst of a much-improved sophomore campaign. While his 76.3 overall grade isn’t earth shattering, he has flashed potential. The Lions, whose running backs have averaged a measly 0.61 yards before contact per carry, will need a win from this matchup if they plan to run the ball successfully on Sunday. HB Theo Riddick vs. LB A.J. Klein – The Lions pass offense has struggled mightily since Week 1 and is in desperate need of creating mismatches in the passing game. This could potentially make Riddick a huge part of the game plan and in turn emphasize this matchup. After a slow start, Riddick has started to come alive over the past two games. In those games, his 2.04 yards per route run ranks eighth among running backs. On the season, Riddick ranks third with 10 forced missed tackles on receptions while his receiving grade of 80.4 ranks ninth among running backs. Klein has really struggled in coverage, earning the 72nd ranked coverage grade among linebackers at 36.5. Not only has Klein allowed a high catch rate into his coverage of 85 percent, he is also allowing 1.39 yards per cover snap which ranks 57th out of 73 qualifying off the ball linebackers. HB Alvin Kamara vs. LB Tahir Whitehead — Alvin Kamara’s primary role is that of a receiving back in New Orleans’ offense. Kamara saw 18 snaps in the passing game in Week 4 against Miami, his second-highest total since Week 1, and his 86.0 receiving grade in the game was his best yet. With the Saints’ trade of Adrian Peterson to the Cardinals, Kamara should see an increase in snaps this week, and he’ll also see Tahir Whitehead patrolling middle of the field. Whitehead’s 85.2 overall grade is ninth among eligible linebackers, and his 8.6 run-stop percentage is 17th among linebackers with 74-plus run snaps. 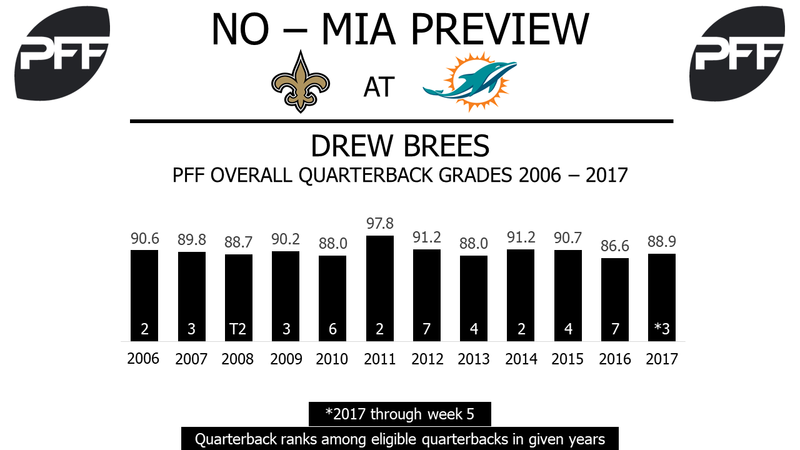 QB Drew Brees vs. S Glover Quin — Things change, and Drew Brees stays great. He has yet to receive an overall grade below 86.6 for a season over the past 11 years, and his 88.9 overall grade through five games is remarkable, if unsurprising. His 50.0 completion percentage on passes of 20-plus yards in this season is tied for fourth among quarterbacks. He’ll face stiff competition in safety Glover Quin when targeting the deeper area of the field. Quin’s 92.5 overall grade is No. 1 among safeties, and his miniscule 0.24 yards allowed per cover snap is tied for 10th best among 60 safeties with at least 105 snaps.